Leadership derailment can be especially costly to an organization in terms of both financial and people costs. When a leader derails, the organization bears the expense of the lost developmental investment in that leader, as well as the costs associated with the individual failing in a position. These costs are coupled with the implications on employee engagement and motivation. Derailment can be emotionally devastating to the individual and have a long lasting impact on the individual’s team and colleagues. Leadership derailers can evolve and change over time, depending on the environmental conditions and organizational demands. A characteristic that might not have derailed someone ten years ago could easily derail the individual today (i.e., insensitivity to gender issues, or racial bias). Similarly, what causes a leader to fall off track in one company may not do the same in another. While there are proven themes, organizations should define the specific derailing factors that align with their culture and strategy in the same way they define leadership competencies (see Competency Models: One Size Does Not Fit All). Poor selection processes - not accurately assessing skills, capabilities, and/or culture fit. Promoting people so fast that they never finish a job and learn from their experience in any one position. Linking success and rewards too closely to moving up the organizational hierarchy. Tolerating “bad behavior” from individuals recognized for achieving strong business results. Allowing one failure to knock someone off of a leadership growth track without supporting learning from mistakes. Emphasizing results or “what you did” feedback over “how you did it” feedback. Allowing functional/business unit talent hoarding which limits an individual’s ability to develop broad leadership skills and perspective. Understanding and defining derailers is the first step for organizations to take in trying to minimize leadership derailment. Creating a framework of derailing factors will create a foundation for selection, development and succession planning processes. Consider the following three steps to reducing leadership derailment in your company. Provide leadership with frequent opportunities for formal and informal feedback. 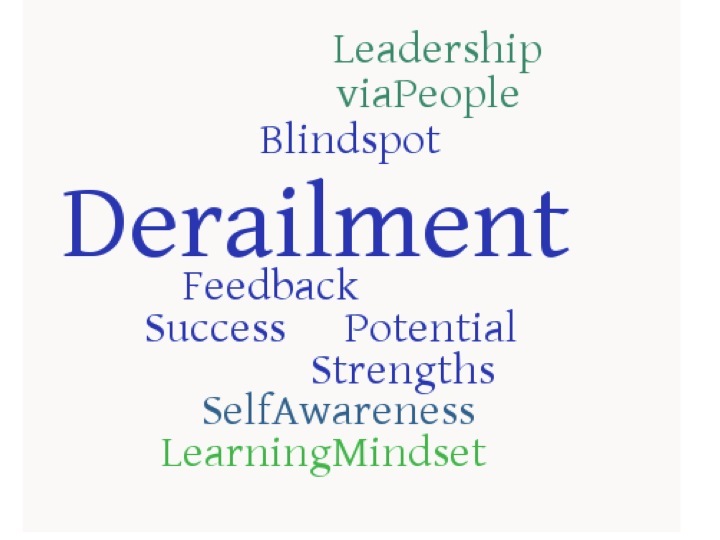 Integrating derailing behaviors into 360 degree feedback and ongoing development discussions can help leaders develop accurate self-awareness and have the chance to change behaviors based upon feedback. Integrate the assessment of derailers into the talent assessment and succession planning process. Derailers should be considered along with other important criteria used to determine performance, potential and readiness. Derailing behaviors can greatly limit the impact of other characteristics, including intellectual capability and technical skills. Provide coaching for leaders as they assume new roles and responsibilities. Support during stressful times can help leaders keep potential derailers in check and smooth the transition into a new position. The Industrial Organizational Psychologists at viaPeople have worked with many organizations to integrate leadership derailment into the talent strategy and talent management processes. Click below to contact a consultant to discuss your specific needs.